Stable climatic conditions: Corals are highly susceptible to quick changes. They grow in regions where climate is significantly stable for a long period of time. Perpetually warm waters: Corals thrive in tropical waters [30°N and 30°S latitudes, The temperature of water is around 20°C] where diurnal and annual temperature ranges are very narrow. Shallow water: Coral require fairly good amount of sunlight to survive. The ideal depths for coral growth are 45 m to 55 m below sea surface, where there is abundant sunlight available. Clear salt water: Clear salt water is suitable for coral growth, while both fresh water and highly saline water are harmful. Abundant Plankton: Adequate supply of oxygen and microscopic marine food, called plankton [phytoplankton], is essential for growth. As the plankton is more abundant on the seaward side, corals grow rapidly on the seaward side. Little or no pollution: Corals are highly fragile and are vulnerable to climate change and pollution and even a minute increase in marine pollution can be catastrophic. Many invertebrates, vertebrates, and plants live in close association with corals, with tight resource coupling and recycling, allowing coral reefs to have extremely high productivity and biodiversity, such that they are referred to as ‘the Tropical Rainforests of the Oceans’. Scleractinian corals build skeletons of calcium carbonate sequestered from the water. Scleractinian corals come under Phylum Cnidaria, and they receive their nutrient and energy resources in two ways. They use the traditional cnidarian strategy of capturing tiny planktonic organisms with their tentacles (All about Phylum Cnidaria is given in NCERT). Having a symbiotic relationship with a single cell algae known as ZOOXANTHELLAE. Zooxanthellae are autorophic [prepare their own food] microalgaes belonging to various taxa in the Phylum Dinoflagellata. Zooxanthellae live symbiotically within the coral polyp tissues and assist the coral in nutrient production through its photosynthetic activities. These activities provide the coral with fixed carbon compounds for energy, enhance calcification, and mediate elemental nutrient flux. The host coral polyp in return provides its zooxanthellae with a protected environment to live within, and a steady supply of carbon dioxide for its photosynthetic processes. The symbiotic relationship allows the slow growing corals to compete with the faster growing multicellular algaes. The corals can feed by day through photosynthesis and by night through predation. The tissues of corals themselves are actually not the beautiful colors of the coral reef, but are instead clear. The corals receive their coloration from the ZOOXANTHELLAE living within their tissues. Disturbances affecting coral reefs include anthropogenic and natural events. Recent accelerated coral reef decline is related mostly to anthropogenic impacts (overexploitation, overfishing, increased sedimentation and nutrient overloading). Natural disturbances which cause damage to coral reefs include violent storms, flooding, high and low temperature extremes, El Nino Southern Oscillation (ENSO) events, sub aerial exposures, predatory outbreaks and epizootics. Coral reef bleaching is a common stress response of corals to many of the various disturbances mentioned above. When corals bleach they commonly lose 60-90% of their zooxanthellae and each zooxanthellae may lose 50-80% of its photosynthetic pigments. 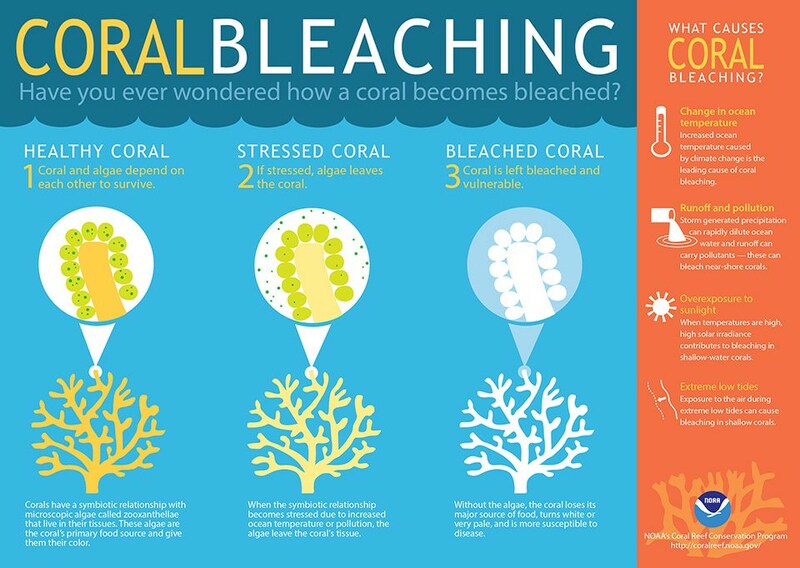 If the stress-causing bleaching is not too severe and if it decreases in time, the affected corals usually regain their symbiotic algae within several weeks or a few months. If zooxanthellae loss is prolonged, i.e. if the stress continues and depleted zooxanthellae populations do not recover, the coral host eventually dies . Coral species live within a relatively narrow temperature margin, and anomalously low and high sea temperatures [corals are absent on the west coast of tropical temperate continents because of the cold currents] can induce coral bleaching. Bleaching events occur during sudden temperature drops accompanying intense upwelling episodes [El-Nino], seasonal cold-air outbreaks. Most reefs recovered, with low levels of coral deaths, but damage has been severe at places. This is an instance of coral reefs’ susceptibility to increased water temperatures combined with OCEAN ACIDIFICATION. While the rising temperatures have increased the frequency and intensity of bleaching, acidification has reduced corals calcifying ability. Small temperature increase over many weeks or large increase (3-4 °C) over a few days will result in coral dysfunction. 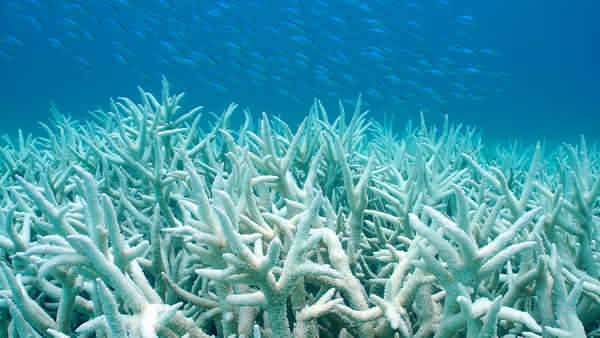 Coral bleaching has occurred mostly during the summer seasons or near the end of a protracted warming period. They are reported to have taken place during times of low wind velocity, clear skies, calm seas and low turbidity. The conditions favor localised heating and high ultraviolet (UV) radiation. UV radiation readily penetrates clear sea waters. The corals actually contain UV-absorbing compounds which can block potentially damaging UV radiation. But rising temperatures mean reduction in the concentration of these UV absorbing compounds in corals. Sudden exposure of reef flat corals to the atmosphere during events such as extreme low tides, ENSO-related sea level drops or tectonic uplift can potentially induce bleaching. The consequent exposure to high or low temperatures, increased solar radiation, desiccation, and sea water dilution by heavy rains could all play a role in zooxanthellae loss, but could also very well lead to coral death. Rapid dilution of reef waters from storm-generated precipitation and runoff has been demonstrated to cause coral reef bleaching. Generally, such bleaching events are rare and confined to relatively small, near shore areas. Rather than causing coral reef bleaching, an increase in ambient elemental nutrient concentrations (e.g. ammonia and nitrate) actually increases zooxanthellae densities 2-3 times. Although eutrophication is not directly involved in zooxanthellae loss, it could cause secondary adverse effects such as lowering of coral resistance and greater susceptibility to diseases. When corals are exposed to high concentrations of chemical contaminants like copper, herbicides and oil, coral bleaching happens. Pathogen induced bleaching is different from other sorts of bleaching. Most coral diseases cause patchy or whole colony death and sloughing of soft tissues, resulting in a white skeleton (not to be confused with bleached corals). Nearly all of the world’s major coral reef regions (Caribbean/ western Atlantic, eastern Pacific, central and western Pacific, Indian Ocean, Arabian Gulf, Red Sea) experienced some degree of coral bleaching and mortality during the 1980s. Prior to the 1980s, most mass coral moralities were related to non-thermal disturbances such as storms, aerial exposures during extreme low tides, and Acanthaster outbreaks. Coral bleaching accompanied some of the mortality events prior to the 1980s during periods of elevated sea water temperature, but these disturbances were geographically isolated and restricted to particular reefs zones. In contrast, many of the coral bleaching events observed in the 1980s occurred over large geographic regions and at all depths. Recent research has revealed that corals that are consistently exposed to low levels of stress may develop some kind of resistance to bleaching. The third global coral bleaching is in progress (2015-16) — after events in 1998 and 2010. The present one is the longest and most severe so far. The longest and most severe El Niño ever is the main cause. Coral reef ecosystems are less than 0.1% of the ocean area but provide food and shelter to 25% of all marine species. They support fish stocks on which some 500 million people are dependent globally. Mass bleaching can turn a coral dominated reef to an algae dominated one in the space of a few months — a process that can take decades or longer to reverse.